Basquil & Co. were tailors & breeches makers, ladies' costume & habit makers, with a shop at Buxton House next to Hunter's on Dale Road in 1908. They advertised in Kelly's Directory for that year. Mr Basquil, who was born in Leeds to Irish parents, was living with his family in Stockport in 1881. He married Sarah Jane Spencer at Bury Register Office in 1889 and by 1891 they had moved to Pilgrim Street in Sheffield where William was employed as a tailor's assistant. 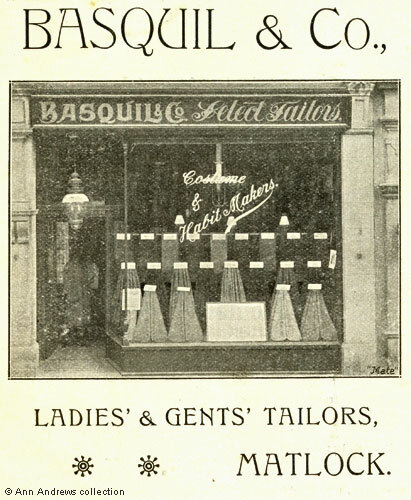 The Basquils were living in Matlock in 1901; they had been in the town since approximately 1897. In 1905 Mr. Basquil had rescued a boy called Ernest Holmes from drowning in the Derwent, despite being unable to swim. He was presented with an with award of the Royal Humane Society for bravery at Matlock Police Court. The Basquil family later emigrated to Australia. The Crown Hotel in 1910 was "replete with every modern convenience for visitors and commercials". 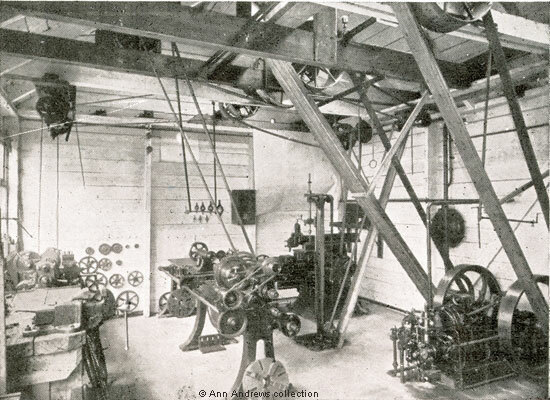 There was a motor garage and inspection pit. It was then still a relatively new building. Although a Crown Inn had been in Matlock for many years, the Crown Hotel did not move to the newly built premises on the corner of Bank Road until 1883, when Mr. Peglar was the licensee. 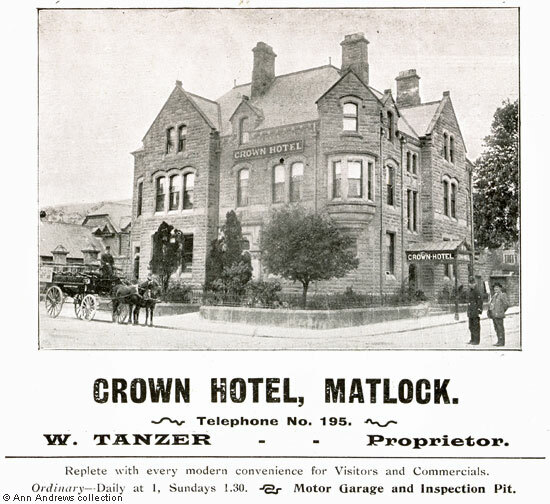 William Tanzer, from Long Eaton, was the proprietor in 1910 and had previously advertised in Kelly's (1908) Directory. He was still there in 1916. The stables and gardens are long gone but the building, now Crown Buildings, is still unmistakable. The Crown, now a free house, has moved a few yards back down Bakewell Road to what was Furniss's and later Allen's garage. 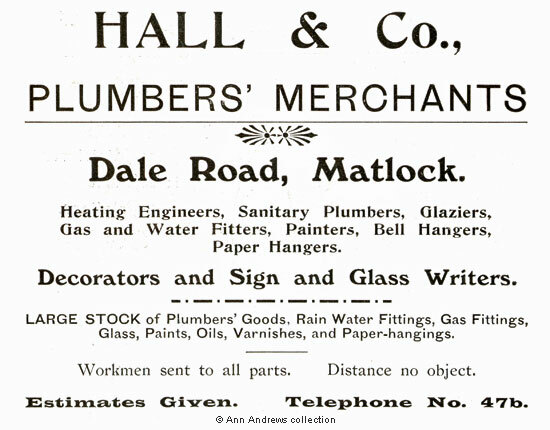 In 1910 Hall and Co., Engineers, Matlock had a 'full stock of accessories for Motor Cars, Cycles., etc.' They advertised that 'Repairs of every kind executed by Skilled Mechanic'. The company was founded in 1886 by Robert Hall who was head of the company for many years. Jack Massey as their sole employee and was still there in forty-two years later. By then the company had a regular staff of about 50 men and a range of departments: heating, electrical and water engineers, plumbers and gas fitters, decorators, general ironmongery and tinsmiths who competed for and won large projects in various parts of the country. Repairs for many of Matlock's hydros were carried out in their smiths' sheds. It was acquired about 1925 by Mr. F. Wildgoose. 1. Image of Basquil & Co. of Dale Road is from 1908 Matlock Operatic Society Programme..
2, 3 & 4. All other images from the 1910 Matlock Operatic Society Programme. See Basquil's entry in Kelly's Directory 1908. He also advertised in Kelly's Directory 1899. The family can be found living on Dale Road in the 1901 census. They left Matlock before the 1911 census. "Derby Daily Telegraph", 5 June 1905. The boy's father was Walter Holmes. See: Kelly's Directory, 1908 | Kelly's Directory, 1912 | Kelly's Directory, 1916. Joseph Tummon had been the hotel proprietor before then. He can be found in Kelly's Directory, 1899 and the 1901 census. "Derbyshire Times and Chesterfield Herald", 29 September 1928.